The Other Les: OH [BLEEP] ! According to The Daily Mail website two men dressed as woman attempted to enter the headquarters of the national Security Agency in Fort Meade, Maryland while driving a stolen SUV. They were stopped by a NSA Police officer and a firefight broke out. 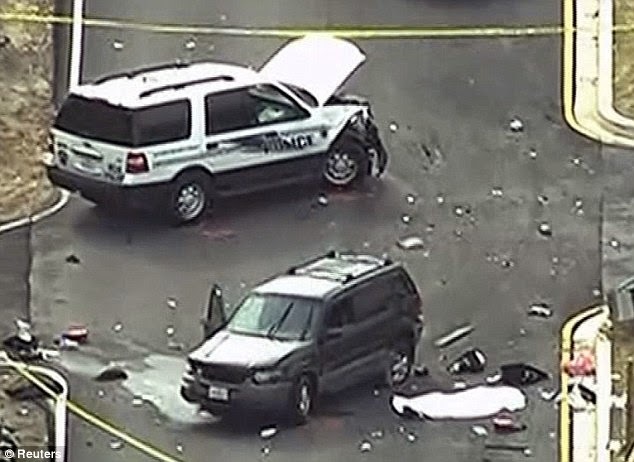 One of the apparent terrorists is dead and the other is wounded along with the NSA Police officer. I'll try to check other sites for more information. "The FBI says terrorism is not a suspected motive in a Monday morning shooting at the gate of the National Security Agency headquarters at Fort Meade." Well if this isn't a terrorist action what is it? It's certainly not a sketch from Monty Python's Flying Circus. Given the consistently dishonest behavior of Federal Agencies under the present administration I have to say that I don't believe the FBI statement. This is clearly not a practical joke. Something is being covered up. And again we are being lied to by our government. Of course it is entirely possible that two men dressed as women were actually dumb enough to try to drive through the front gate at the NSA. After all The Big Zero got elected.